Few weeks back, I had written about India's Mars sniffer spacecraft that was to have been launched in November-December of this year from Sriharikota on eastern sea board of India. As per latest the news. The spacecraft had already moved from ISRO workshops in Bengaluru city to Sriharikota, where it is supposed to be integrated with its launch vehicle PSLV C 25 already at the launch site. The integration is supposed to begin by October 10th, 2013. Traditionally, ISRO avoids any rocket launching from Sriharikota during October and November as it is generally considered as a cyclone season. However, Mars spacecraft would be an exception as only between November to early December, planets Mars and earth would be in a position, which is suitable for launching the spacecraft. ISRO says that this launch window is important and crucial. They must launch the spacecraft in this period, hoping that the weatherr does not play spoilsport. If the window gets lost due to some reason or other, Planet Mars and Earth would not be coming is same positions for 24 months. India's 4.5 Billion Rupees Mars orbiter mission (MOM), is scheduled for lift-off at 4.15pm on October 28 as per present plans so that by the time it reaches a Geo Synchronous orbit after 20 days, the window would be still open. 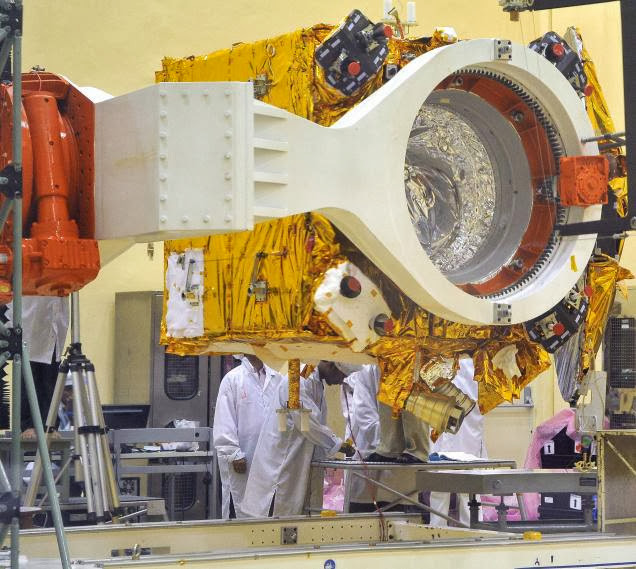 One of the problems with the Mars mission is that unlike other near earth satellite launches and even Lunar mission, spacecraft would be out of coverage area of India's navigation systems, during the launch and post-launch phases. To overcome this difficulty India has contracted American space agency NASA, who have agreed to provide communication and navigation support to track the spacecraft for Indian Space Research Organisation at reimbursable cost. Nasa's deep space network facilities in Spain, Australia and the US are scheduled to provide navigation and tracking support, which would help in accurate determination/ reconfirmation of orbit and position of spacecraft. According to an ISRO spokesman, this NASA support alone will cost ISRO about Rs 700 Million. This is the area, where the latest difficulty has now arisen for the Mars mission. The present US government shutdown, that has inconvenienced millions of Americans, has made is compulsory for NASA's 97% of its 18,000-strong workforce, to go on unpaid leave. This has left many of its tracking stations worldwide unmanned. The ISRO's Mars mission is banking on such stations to track the spacecraft. US Government shutdown has thus become another source of worry for ISRO scientists working on India's ambitious space programme to Mars. ISRO says that the launch window is so crucial because as Mars and Earth will not be in positions suitable for such a launch programme till the end of 2015 or beginning of 2016. In other words if present window is lost, the spacecraft would have to wait for at least 2 years. As per present schedule, the spacecraft is supposed to have been launched in the beginning of the window. If NASA support is unavailable due to Government shut down, it may be posssible to delay the launch at the most till early December. But once that is lost, next opportunity would come after almost 24 months. The US government shutdown has not only inconvenienced millions of Americans, it is also worrying India's scientists working on ambitious space programme to Mars. There appears to be a ray of hope for ISRO. NASA has announced that that it would go ahead with its own MAVEN (Mars Atmosphere and Volatile Evolution) mission, slated for launch as early as November 18. This would mean that NASA would keep its international network of antennas that track interplanetary spacecraft missions, operational. This would suffice for India's Mars mission. ISRO scientists are taking relief from this announcement as they go ahead with the launch preparations.